I am approaching the end of my first season as a non-league football supporter, and I have been reflecting on what it is about the semi-pro game that I love so much. 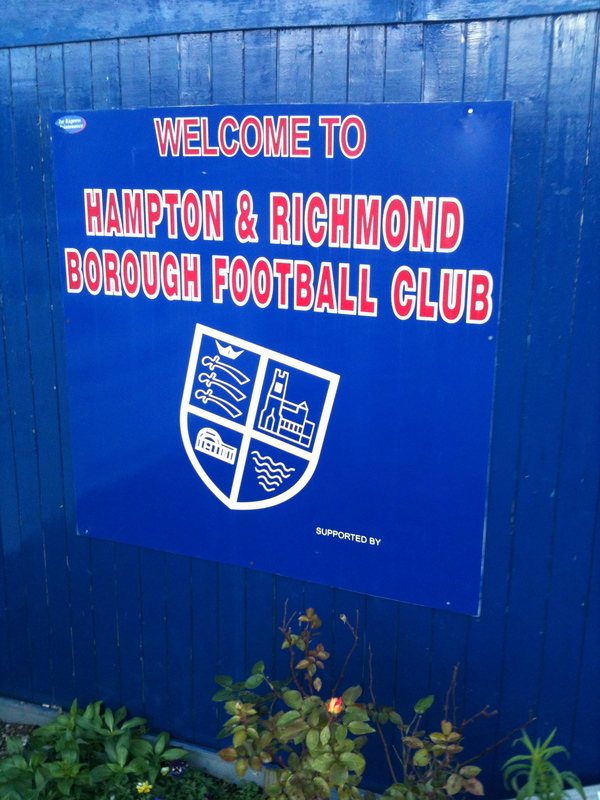 I took in my first non-league game as recently as September 2011, when my chosen club, Hampton & Richmond Borough, had a home game against Chelmsford City. It’s a good job I didn’t let that result affect me; Hampton were thrashed 4-0! Before I go any further, though, maybe I should provide a bit of backstory. I am 33 years of age, and have supported my hometown club Huddersfield Town for more than twenty largely unsuccessful years, ever since my dad took me to watch them play Southend United in 1989 (Town won 3-2 so I am not always a jinx! Mind you, they were three up at one point!). I have always preferred the lower leagues as a result. I also have a three year old son who loves to kick a ball around. I decided this season that I would like to take him to some live matches, and get him hooked on our wonderful game from an early age. This led me to a dilemma. As I now reside in Middlesex, taking him to Huddersfield wasn’t feasible, and anyway they are not his hometown club. It would be unfair to inflict them on him! The nearest professional club to us is Brentford, but this presented problems of it’s own. For starters, they play in the same division as Huddersfield, and have done for a lot of those twenty-odd seasons that I have supported Town. There is no way that I could fake enthusiasm or support for The Bees. Add to that the growing cost of going to league games, not to mention living, and Griffin Park was ruled out as our footballing home. That of course meant only one thing; we would have to take in a non-league club. That gave me the problem of picking which of the multitude of clubs in the area we should support. I have always had a soft spot for Hampton & Richmond Borough (nicknamed The Beavers), partly because I work with one of their former strikers, and partly because it lies on the bus route from my house to Kingston-Upon-Thames, making the journey to games that bit easier. I could have chosen Staines Town, but that would mean driving to home games. I could have chosen any number of clubs, but I settled on finally getting to a match at Hampton’s delightful Beveree Stadium. And so we come to that overcast day in September 2011, and our first taste of non-league. I should at this stage point out that I was finally persuaded to get along to the game by the guys from the excellent Two Footed Tackle podcast, who are vehement supporters of non-league football, and of the brilliant Non-League Day, which is held a couple of times a year when there are no Premier League matches being played, usually on International weekends. The idea being that because England play on a Friday night now, then supporters should take the opportunity to get along to a local non-league club on the Saturday afternoon. Even with the scoreline at the end of the game, both myself and my son had had a great afternoon. We were made very welcome by the locals, and the friendly stewards and staff, and from then on we were both Beavers. We have since been to plenty of games, both home and away, and have no intention of stopping anytime soon. I have also now taken on a second non-league club, in the shape of Ashford Town(Middlesex). This occurred one Saturday afternoon when we were planning on going to watch Hampton’s reserve team. This game was called off, and so I put a call out on twitter for recommendations. Ashford responded via their webmaster Gareth, and so we headed off there, and can be found there fairly regularly, depending on my shifts and Hampton’s fixtures. So that brings us to the title of the article: Why I Love Non-League Football. There are so many reasons. Firstly, the supporters. They really support the club, they know all the history, all the players. This is their club, their passion. A lot of them don’t support another club aswell; Hampton, or Ashford, are it. Then there is the whole matchday experience, which is where it really matters. going to a non-league game reminds me so much of when I first started going to Huddersfield games at the fantastic old Leeds Road ground. You can change ends at half time, something which I hadn’t been able to do for years since the advent of all-seater atmospehere-less stadiums. There is also no fan segregation; you can spend the whole game stood next to a rival fan and not hide who you support. The key word in that last sentence being stood. It is amazing just to be able to stand at a game these days. There are no bans on alcohol at pitchside, so you can stroll into the clubhouse at any point during the game, get yourself a pint, and take it back out onto the terrace to enjoy whilst watching the match. You can even smoke if you want! You also get to hear pretty much everything that goes on on the pitch. You can hear the refs, the players, the managers. You can even have banter with the opposition goalkeeper when the ball is at the other end! And after the game, you can go into the clubhouse and actually speak to the management and the players, and congratulate/commiserate/berate as appropriate! Two of my other favourite things involve the match ball. Growing up, I had always, always wanted to catch the match ball when it was kicked into the stands. Alas, this never happened. While I’ve been going to non-league matches, I have caught or touched the match ball on numerous occasions. The other thing is a little game to play if the match is a little dull: counting how many balls go out of the ground! My personal best was recently set at Ashford Town, a non too shabby seven balls exited the ground from clearances. Not bad! I am now a fully converted non-league fan. I didn’t want my son to grow up blindly supporting Chelsea, or Arsenal, or whichever club his school friends support. I want him to appreciate football from inside the ground, and if he still supports a big club but wants to continue watching Hampton, then that is fine with me. I cannot recommend non-league strongly enough. There is a huge community of fans and clubs and journalists on twitter, all of whom will interact with you and share their views. It really is one of the best things I have done regarding football, and I urge you all to get down to as many non-league games as you can. I may not always live in Middlesex, but wherever I find myself in the future, you can be sure that I will be on the terraces of one of the local non-league teams. I will always be a Beaver though! 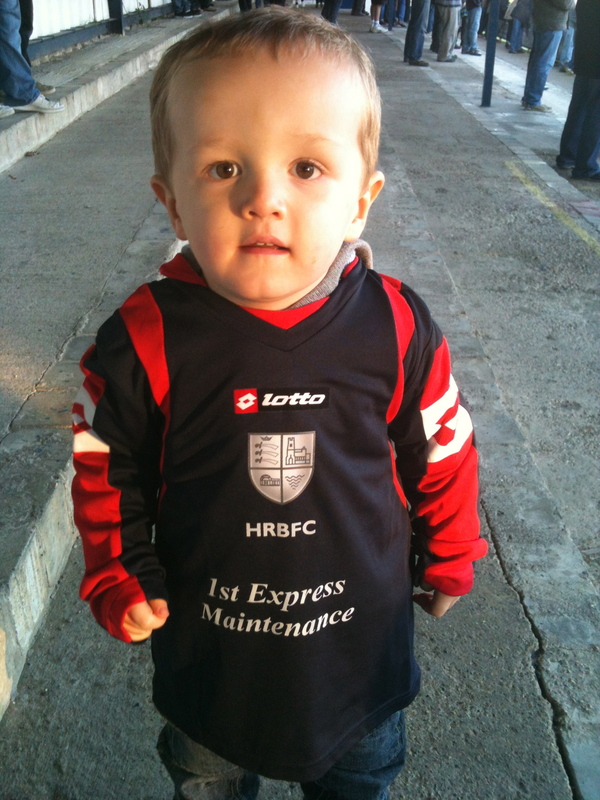 Posted on March 23, 2012, in UTL Archive and tagged Hampton & Richmond Borough, Non League Day, Non-League. Bookmark the permalink. 7 Comments. If you like counting how many times the ball gets kicked out of the gorund, try a visit to Bolton side Daisy Hill – they use it as an admitted time wasting tactic for the last 20 minutes of any game that they’re not losing! Love it James! If only more people realised the beauty of non-league. Pro club’s ticket prices go up and up like mad every year, and even simple things like programmes and a burger & pint at the game are extortionate now – but so many people don’t know how good the alternative actually is. Non-league is how football should be, proper players fighting for the cause; nearly all have a 9-5 as well and have a real love for the game. Banter from the terraces, and interacting with the supporters is all part and parcel of it, and makes the whole experience that more rewarding, for the players, managers, and fans. Hopefully this blog gets lots of views, and can convert more people to the real beautiful game. I agree Miki re the players. The fact that they all have to work full time during the week, and then give up their spare time to try and get three points on the weekend, or use their holidays for long midweek trips, should not be underestimated. These are proper players living the dream, fighting for the fans, the club, the shirt. Not the money, although of course they don’t do it for free. Non-League is the future of football, and I hope more people get involved. I have genuinely been stunned by the response to the article. Seems like lots of people feel the same! Couldn’t agree more with this article. I’ve been a Non-League fan all my life (apart from five “glory” years) following Kidderminster Harriers. Of course – having been in the league – we can no longer switch ends but there’s still very much a Non-League feel around the club. I also – coincidently – had the pleasure of visiting The Beveree this weekend. I was writing for The Non-League Paper as part of my work experience (so if you read the paper I hope you enjoyed my match report) and despite the poor quality on show it was obvious what a wonderful little club it is. It reminded me very much of my adopted club (Guiseley – I now live in Leeds – although I may have to stop if they go up this season). But anyway my main point was to say how much I agree with your article – and how much it echoes the sentiments of any arguments I have with my friends who support Premier League clubs – and that I’m pleased I was able to come across your blog.